FRIEDRICHSHAFEN, Germany (BRAIN) — The 17-year-old Czech Republic brand, Apache Bicycles, made its first Eurobike appearance here this year. Apache's branding shocked some visitors from the U.S.
FRIEDRICHSHAFEN, Germany (BRAIN) — A collaboration between the Italian auto brand Maserati, the Danish e-bike brand Diavelo (an Accell Group brand), and the Chinese e-bike motor maker Bafang has resulted in a line of Maserati e-bikes on display at Eurobike here this week. 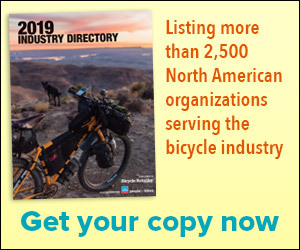 FRIEDRICHSHAFEN, Germany (BRAIN) — The July timing might be a change, but Eurobike remains a key product introduction opportunity for many suppliers. Here's a look at some of the introductions BRAIN spied on the event's opening day. First day Eurobike report: New stuff from Wike, CeramicSpeed, Oakley, Saris, Gates, Bryton, and more. FRIEDRICHSHAFEN, Germany (BRAIN) — This year’s Eurobike show is set to open Sunday, a day after the Tour de France begins. WASHINGTON (BRAIN) — Now that the Supreme Court has (almost) resolved the state tax issue for online retailers, the time might be right to push to increase the collection of import duties. U.S. consumers can often buy from non-U. S. sites without paying sales taxes or import duties. Sometimes that gives foreign retailers a head start of 20 percent or more. WASHINGTON (BRAIN) — The U.S. Supreme Court on Thursday ruled that states may require online retailers to collect sales tax revenue from online consumers who live in their states. The National Retail Federation called the decision "a major victory" for retailers. Some see the decision as a victory for mom-and-pop store owners; but a challenge for those with small e-commerce businesses.